The three-hundred or so medium broadcasting stations of Japan's Nihon Hoso Kyokai (NHK) are organized into two separate networks, each of which may then be thought of as being organized into four tiers of stations of descending physical size and transmitter power. The two networks, NHK Program 1(NHK-1) and NHK Program 2(NHK-2) are each led by a central station in Tokyo; NHK-1 is headed by station JOAK, which operates on 594 kHz. with 300,000 watts of power. NHK-2 is led by JOAB, 693 kHz. using 500,000 watts. These two mega-stations and the central NHK production facilities where they are headquartered produce the vast majority of the programming that is broadcast over their respective networks. JOAK, NHK-1 Tokyo, 594 kHz. JOIK, NHK-1 Sapporo, 567 kHz. JOLK, NHK-1 Fukuoka, 612 kHz. JOBK, NHK-1 Osaka, 666 kHz. JOCK, NHK-1 Nagoya, 729 kHz. JOAB, NHK-2 Tokyo, 693 kHz. JOIB, NHK-2 Sapporo, 747 kHz. JOUB, NHK-2 Akita, 774 kHz. JOBB, NHK-2 Osaka, 828 kHz. JOGB, NHK-2 Kumamoto, 873 kHz. JOLB, NHK-2 Fukuoka, 1017 kHz. Looking at the geographic distribution of these mega-stations, NHK has located one of each network to serve regionally in the southwest of the country (Kyushu Island), one or two in the north to serve the vast area of Hokkaido Island and two or three in central Honshu Island to serve the large population that lives in cities and towns located in the heartland of Japan. The third tier of stations represents the backbone of each NHK network and, together, probably serve the majority of Japanese listeners. The third tiers are each made up of so-called "Key Stations" located in the principal city of virtually every prefecture in Japan (each network has around 35 Key Stations in the 47 prefectures of Japan. Prefectures lacking a key station are served from either regional or national sources). Each of these stations is equipped and staffed to provide its local prefecture-wide audience with a limited amount of locally-produced programming, along with simulcasting the vast majority of the programs from the Central Station of their network. The key station staff also provides on-the-scene news coverage for the entire national network from news sites throughout their local prefecture. The transmitting power of these Key Stations is normally either 10 kW. or 5 kW., though a small handful operate 1 kW transmitters. Each key station is assigned call letters and may be considered a complete station. In fact, prior to national networking, a number of these stations may very well have operated as independent government-owned stations. The fourth and generally lowest-powered tier of NHK stations consist of relay or "slave" transmitters which are located in many of the towns and villages of Japan that are, for reasons of topography or distance, poorly served by signals from their prefectural key stations. Currently, NHK-1 Network has about 170 relay stations. Of this number, 136 are totally automated 100 watt relays. These transmitters have no offices and no staff and are likely only visited occasionally by a technician stationed at the Prefectural NHK offices. The NHK-1 network also operates two similar 500 watt relays and 35 others ranging from 1 kW. to 10 kW. Some of the thirty 1000 watt relays have call letters assigned and were, most probably, "real" staffed stations in the past. This is most certainly true of the two 3kW., one 5 kW. and the two 10 kW. NHK-1 relay transmitters. It is unclear whether any of these more powerful former stations have retained any staff or autonomy. Given the economics of modern broadcasting, it is unlikely. The relay system of the NHK-2 Network is organized in virtually the same pattern as NHK-1. There are 35 Key Stations and almost 90 relay transmitters. Of the relay transmitters, two use 10 kW. transmitters, twenty-three use 1 kW. transmitters; there are two 500 watt relays and at least eighty 100 watt village relays. Many of the more powerful relay transmitters were likely autonomous stations in the distant past. Like any organism that grew over almost a century, the actual flow diagram of the two NHK medium wave networks is a bit more complex than the description above outlines. The actual networks are complicated by historical anomalies, ad hoc circumstance, topography and geography. Nevertheless, the four-tier organization described above represents at least the concept by which NHK delivers AM radio programming to the Japanese public. 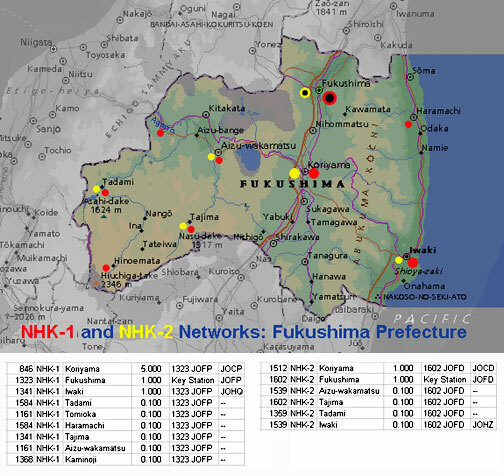 Possibly the best way to visualize the majority of the NHK network is to examine it as it serves the population in one more-or-less typical prefecture: Fukushima Prefecture. Fukushima is located about midway between Tokyo and the northern tip of Honshu, on the eastern or Pacific coast of that Island. It is a medium-sized prefecture, measuring about 166 km. from east to west and 133 km. from north to south. It stretches from a rather straight Pacific coast to the high central ridges of the Japanese Alps, which lay about two-thirds of the way to the west coast of the island. The prefecture is divided from east to west into the three regions. The eastern third of the prefecture is the coastal region, Hama-dori, which consists of the coastal plain and a low coastal mountain range that parallels the coast in a north-south line. The largest city on the coast is Iwaki, near the southern border of the prefecture. The central valley region, Naka-dori, is the heart of Fukushima, containing a 150 km. segment of the main national north-south arteries of transportation and communication: Shinkansen Bullet train and freight rail lines, the primary north-south freeway and the various communications and power grids of a modern nation. The three largest cities of the prefecture lay along this transportation backbone: Shirakawa in the south, Koriyama, a strategic transportation cross-roads in the central region and the prefectural capitol, Fukushima City in the north. The western third of the prefecture, Aizu is mountainous, with a declining population that is located primarily in towns and villages located in the narrow valleys. The largest town in the mountains is Aizu-Wakamatsu. The citizens of Fukushima are served by 15 NHK medium wave transmitters. These are one 5000 watt station (the NHK-1 Key Station) four 1000 watt stations, three of which are now operated as relay transmitters and ten 100 watt "village" relays. It is easy to surmise from the map and list below that all of the 1000 watt stations were at one time semi-autonomous NHK stations. One might guess that the 100 watt NHK-2 repeater in coastal Iwaki, which is paired with a 1000 watt NHK-1 relay, is a modern replacement for a larger obsolete and semi-autonomous NHK-2 station. That is likely why this small automated relay transmitter has, almost uniquely, assigned call letters, JOHZ. Currently NHK maintains a prefectural administrative and production facility in conjunction with the two medium wave Key Stations in the capitol, Fukushima City. There are also very minor branch offices in Koriyama and Iwaki as well as a small news room in Aizu-Wakamatsu. Radio enthusiasts wishing to contact the "station staff" for any outlaying transmitters would probably be best served by writing, instead, to the main prefectural staff in Fukushima City.
. Clear, that is, until the local or regional station ID is given (see below.) Then, one sometimes hears a jumble of call letters, not exactly in sync and definitely not identical. Happily, most of the larger NHK stations are the only Japanese transmitters on their assigned frequency. Most DXers "identify" these stations by inference. A good reference such as Pacific Area Log (PAL) edited by Bruce Portzer, can be used to find a second NHK station broadcasting the same program simultaneously ("in parallel.") If both are the only NHK1 (or NHK2) station on their frequencies and the programs are truly in parallel, it is pretty safe to infer the identity of the station in question. Some DXers use two receivers feeding into stereo earphones to assure themselves that the programming of the two stations is truly identical. Identification by inference is fine for many DXers, but not all; some only feel satisfied when a positive local station identification is clearly heard. With NHK, there are also a handful of frequencies that contain dozens of small NHK stations, all broadcasting one of the two programs simultaneously: the so-called "grave yard channels." Except for very rare station breaks, there is no way to know which of these synchronous stations or, indeed, which combination of stations is being heard. Hearing a local station ID becomes critical for all of us in these situations. As one might expect of Japan's largest broadcaster, the NHK networks are highly organized and automated. Even though there are only a few local station identifications during the broadcast day, they occur at very predictable times and follow a rigidly fixed format. The announcements are pre-recorded and may be read by either a male or a female announcer. The trailing "desu" is optional, is pronounced "dess" and translates as "is" or "This is" in this case. The announcements are pre-recorded and may be read by either a male or a female announcer. The trailing "desu" is optional, is pronounced "des" and translates as "is" or "This is" in this case. Perhaps this section should be titled "predicting what you may hear." If you know a few simple rules of pronunciation and, if you have a Japanese phrase already transliterated from Japanese "Kanji" ideographic writing to the western or "Roman" alphabet, it is fairly simple to write out ahead of time what you should hear, phonetically. There are only a few surprise pronunciations in Japanese that may come into play in the town names of station identification. 1. All R sounds are given a single trill like many Rs in the romance languages, especially Spanish (think of "arriba, arriba! ), so you single-trill the R in "Morioka" is "Moh-ree(trill)-oh-kah." 2. The syllable "fu" is pronounced with a lot of "h" on the "f". Thus the city of Fukuoka may sound to some more like "Hukuoka." 3. Trailing U sound in some words is almost totally missing. This is especially true with the "desu" which is offer heard as "des" in station IDs, as mentioned previously. 4. In the syllable "su," the U is almost always silent. Thus, the Japanese food "sukiyaki" is actually pronounced "ski-yaki" in Japan and the famous naval town "Yokosuka" is pronounced "Yo-kos-ka." 5. All syllables in each word are given about the same level of emphasis. There is not an "accented" syllable to the degree that most English speakers expect. This is especially difficult for native English speakers. Thus "Hiroshima" is "hero-she-ma," not "hero-SHEE-ma." There is one final pronunciation key to station identifications: acronyms or alphabetic letters are pronounced as they would be by an American English speaker reciting the alphabet: A, B, C, etc. This is, of course, very helpful when trying to identify NHK or any of the commercial network broadcasters, as well as when attempting to hear the station call letters themselves. As discussed previously, the fourth and most numerous tier of Japanese stations is made up largely of highly automated "repeater" relay stations that are located in small towns and villages throughout Japan. These transmitters relay the programming of their "key station" which is usually located in the prefectural capitol. In most cases, these "stations" have neither call letters nor staff. These repeater stations are organized with sometimes dozens of either NHK1 or NHK2 repeaters on a given frequency ("graveyard" channel.) It is possible that a handful of these stations do have small local staffs and may give actual local IDs. If that is so, the ID will occur at the times listed for all IDs of that network (NHK1 or NHK2.) The vast majority of these stations will carry one of two IDs: either they will simply repeat the identification of the key station that they are serve, or they will automatically broadcast a generic network ID, with the announcer saying simply "NHK Daiichi Hoso" or "NHK Daini Hoso," as appropriate. There is little that can be done to identify the station if the generic network ID is heard. However, if the key station ID is heard and if you have a list of which repeaters are attached to which key stations, actual local identification can be usually inferred. For some time now, the Pacific Asia Log (PAL) edited by Bruce Portzer has been the definitive reference for MW broadcast stations in South and East Asia as well as the Pacific. As of December 2005, PAL (posted 0905) contains considerable partial information about "key stations" and relays in the Comment entry for each NHK transmitter listed. At the next revision, PAL should contain a complete listing of such data. The PAL may be downloaded free. The NHK stations continue to be among the most reliable QSLers in the world. In general, most stations have a near 100 percent reply rate to detailed, well-written, correct reports. Most Japanese office workers have taken several years of instruction in reading written English, so this is the preferred language for international reception reports to Japan. However, if this proves overly difficult, the Japanese are a cosmopolitan and outward-looking people, so reports in other "major" languages have a good chance of being answered, as well. You should NOT use most computerized translation software, whether on-line or not, to translate addresses from Japanese. These programs generally translate every Japanese ideogram to its literal Western meaning. That may be all right for general conversation, but it does not work for addresses. For instance, many automated translation programs will render "Takayama City, Takayama" to its literal meaning in English "Tall Mountain City, Tall Mountain" It is highly unlikely that the Japanese postal service will be able to deliver such a letter to the station in Takayama. Japan is still an extremely polite society. That is probably the main reason for the marvelous reply rate exhibited by Japanese MW stations. If you receive a reply from a Japanese station, please take the time to send them a "thank you" note. The easiest method is to keep a supply of interesting picture postal cards of your area and simply hand-write a brief message on one, address it and drop it in the post. Be sure and print (block letters) if you write to Japanese by hand. While most office workers can read typed or block lettered English, cursive script writing is a total mystery to most. Finally, have a great time DXing Japan on medium wave. Whether the station is a member of one of the two NHK networks or is operated by one of the excellent commercial broadcasters, it is a window on a fascinating culture. Good luck and Great DX! Professor Bryant served as a Senior Fulbright Research Fellow in Japan in the mid-1970s and is an internationally recognized authority on East Asian Architecture. For the past 25 years, he has sought to hear radio stations throughout East and South Asia on the Tropical Broadcast and Medium Wave bands. Dr. Okuda was born in Osaka and is on the faculties of the schools of architecture at Nihon National University, Tokyo and Oklahoma State University, USA. The ID recordings were made by well known DX authority Nick Hall-Patch during a visit to Japan in April, 2005.